Or, get it for 52800 Kobo Super Points! 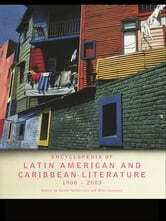 The Encyclopedia of Twentieth-Century Latin American and Caribbean Literature, 1900–2003 draws together entries on all aspects of literature including authors, critics, major works, magazines, genres, schools and movements in these regions from the beginning of the twentieth century to the present day. With more than 200 entries written by a team of international contributors, this Encyclopedia successfully covers the popular to the esoteric. The Encyclopedia is an invaluable reference resource for those studying Latin American and/or Caribbean literature as well as being of huge interest to those folowing Spanish or Portuguese language courses.